Children learn language by watching and listening to others. As a baby your child listens to your voice and tries to copy you with all those lovely babbling sounds. From 6 months onward, some of those sounds begin to sound like words (e.g. dada and baba). Then from 9 months onward, you’ll see your child start to recognise words (e.g. no, ouch, ta and bye-bye) and they will find ways to tell you what they want (e.g. raise their arms to be picked up). Use of individual words can start anywhere from 12 to 15 months. This is the exciting phase when children start to develop a vocabulary of words to let you know their needs (e.g. juice, doll and doggie). 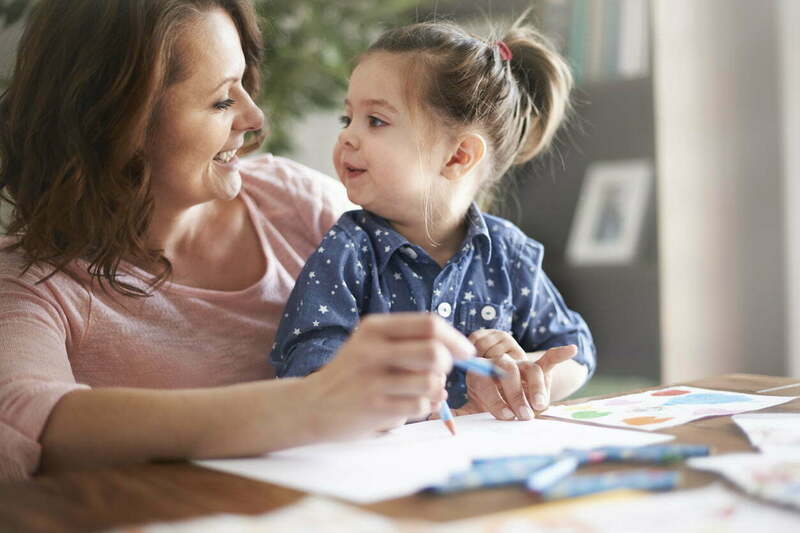 As a parent you play an important role in helping your child develop their early language skills! Taken from The Hanen Centre, the following are some tips to help guide your child’s language development. 1.Use many different kinds of words when talking with your child. 2. Make a point of highlighting a variety of word types when talking to your child, not just the names of things. It is important for your child to learn a variety of word types in order to talk in short sentences. 3. Emphasize action words (sleep, eat, run, push, squeeze, break), descriptive words (soft, hot, big, sticky, funny, tired), location words (up, down, in, on, under), words about belonging (my, your, his, Mommy’s), and feeling words (sad, sick, happy, angry), as well nouns or names of things (dog, book, bed, cup). 5. Talk about your child’s natural interests (e.g. their favourite toy) with them. For example, if your child says “ball”, you can extend this with something like “yes, that’s your big, red ball!”. Children can struggle with language development for a range of reasons. A conversation with a child health nurse, GP or early childhood teacher may be helpful in providing reassurance or pointing you in the right direction. Consulting a speech pathologist for advice may also be helpful as they are able to let you know if there is anything to be concerned about and if there is a need for therapy. The Centre has three speech pathologists available who work on different days of the week. Please call reception on 9274 7062 for more information about our speech pathology services.